The Oakleaf artfully blends heating power with Harman technology. Its compact design is ideal for smaller spaces. Expect sophisticated technology to bolster impressive performance for easy operation. Firebox Capacity: 1.75 cu. ft.
Log Length: up to 18 in. Heating Capacity*: 1,000 - 2,600 sq ft. The Accentra Pellet Insert transforms your drafty fireplace into an efficient, eco-friendly heat source. Expect consistent performance, easy operation and loads of options to make it your own. After all, it is the most popular pellet insert in the industry. The P35i pellet insert delivers amazing efficiency in a compact design. 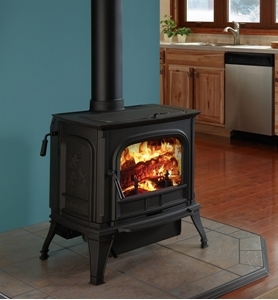 The XXV Pellet Stove offers exquisite cast-iron detailing in a high-performance pellet stove. It is loaded with premium technology and designed to highlight the many years of Harman excellence. If you want to heat your home in the most natural, environmentally friendly way, Harman wood pellet stoves are a great option. By burning pellet fuel with a pellet stove, you are making an eco-friendly and cost effective decision that’s good for your wallet, and the environment.